Related Articles: Blennioid Fishes, True/Combtooth Blennies, Saber-Tooth Blennies, Labrisomids, Convict "Blennies"
Blennies are small, goby-like fishes that are common in shallow water marine environments particularly tide pools, harbours, and reefs. Most blennies have smooth, slimy bodies, large paddle-like pectoral fins, and very often distinctive 'cirri' or whiskers on the face above the eyes. Some species are specialist carnivores of one sort or another, in some cases feeding on shelled invertebrates such as barnacles or on the skin and fins of larger fish. Others are chiefly herbivorous, feeding on algae, and some of these species have become popular as algae-eaters in marine aquaria. But most are omnivores and will eat a variety of foods particularly small crustaceans and worms. While there are some large blennies, the majority are relatively small, commonly 3-6" in length. Although it is quite often said by aquarists that blennies are 'some type of goby' the two groups of fish are entirely distinct, and their superficial similarities merely a product of convergent evolution. On the one hand, both are bottom-dwelling fish with a preferences for caves or burrows, and both have long, eel-like bodies and big, downward-pointing mouths. But gobies also have fused pelvic fins that form a sucker with which they can hold onto the substrate and so keep their position in strong water currents. Blennies lack this adaptation, and in many cases the pelvic fins are reduced to simple 'struts' they prop themselves up on when resting. On the other hand, the cirri above the eyes on most blennies are distinctive and not seen on gobies. These differences aside, gobies and blennies are ecologically very similar as well, and often occur together in the same environments. Both are, for example, classic tide pool fishes throughout the tropical and temperate zones. Chasmodes bosquianus (LacepÃ¨de, 1800) or Striped Blenny is found along the Western Atlantic coastline from New York to Florida. Most common in oyster beds and around mangrove roots. Like the Freshwater Blenny this species isn't traded much but may be kept by aquarists able to collect their own stock from the wild. A subtropical brackish/marine species this blenny needs to be kept at reasonably high salinities to do well, i.e, SG 1.010 or more. Use empty oyster shells to create a reef in which these fish can set up their homes. As with other blennies, these fish are territorial and should not be forced to fight for living space. Congrogadus subduscens (Richardson, 1843) is sometimes traded as a marine fish under the 'green eel blenny' name. It is not a blenny, but a dottyback (family Pseudochromidae) but it is of passing interest to us here because it is commonly found in estuaries and mangroves and adventurous aquarists have had some success keeping this fish in high-salinity (SG 1.015-1.018) brackish water aquaria. Large, territorial, and predatory this fish is only viable in systems with similarly robust tankmates such as scats and monos. Lupinoblennius paivai (Pinto, 1958) is known as Paivia's Blenny or the Brazilian Freshwater Blenny. Relatively scarce in the wild this fish is not regularly traded. It is fairly small (around 2") but still quite territorial and although most contests between males are based around displays of size and colour, equally-matched males will nip at one another. Quite strongly sexually dimorphic, the males have a comb on the top of the head and a taller dorsal fin with a distinctive overhanging flap on the leading edge. Males will also use colour changes to display to females and rival males. Adults live in burrows in the roots of mangroves produced by shipworms. When the tide is out, they can survive many hours out of water inside these damp and shady burrows. In the aquarium, providing these fish with suitable alternatives such as hollow ornaments or caves is important. Apparently lives where fresh and brackish water meet, so hard, alkaline water with a low salinity (SG 1.005-1.010) is recommended. Feeds primarily on small crustaceans. 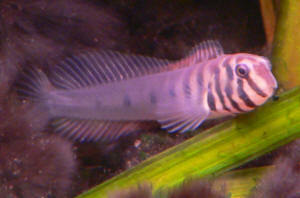 Omobranchus zebra (Bleeker, 1868) is known as the Zebra Blenny or Vietnamese Freshwater Blenny in the aquarium trade. It is found in mangrove and brackish waters fringing the Indian and Western Pacific Oceans from India through to Philippines, though oddly enough not from Vietnam, despite the common name! Maximum length is about 2.5". Hard, alkaline water with some salt added (SG 1.005+) seems to be essential to the long-term health of these fishes though they seem to tolerate maintenance in freshwater adequately well for short periods. They can also be kept in marine aquaria. Zebra Blennies are distinctly territorial and need to be given plenty of space is kept with their own kind or with other, potentially competitive fishes, such as gobies. They are predatory and will attack surprisingly large prey, including shrimps almost as large as they are! They also enjoy bloodworms and other such foods. Do not seem to eat algae. This species is very pretty, with a greyish body marked with bold dark grey and off-white approximately vertical bands that are strongest on the head but become fainter towards the tail. Other brackish water species of Omobranchus may turn up in the future, and these will likely require similar care. Salaria fluviatilis (Asso 1801) is traded as the Freshwater Blenny and is found primarily in clean, well-oxygenated waters that flow into the Mediterranean, from Spain to Turkey and Israel and along the African coast to Algeria and Morocco. May be found in lakes, streams, and rivers but is intolerant of polluted waters (and consequently increasingly rare across much of its natural range). Now commonly traded, this species is primarily of interest to European, Levantine, and North African aquarists able to collect their own livestock. Provided it is kept in a spotlessly clean aquarium with plenty of oxygen and water current, this is an adaptable species that does fairly well, and it has been bred in home aquaria. Eggs laid on the roof of a cave and guarded my male until they hatch. Sexually dimorphic, the male develops a 'comb' on the top of his head. Neutral, moderately hard water at subtropical temperatures (around 64 F) is best. When kept at tropical temperatures these fish are short-lived. Up to 6" in length. Territorial, likes to dig, and needs plenty of hiding places. Feeds on worms, insect larvae, etc. Salaria pavo (Risso, 1810) the Peacock Blenny is a widespread and common brackish water blenny found along the Eastern Atlantic and Mediterranean coasts of Europe and Africa. Very tolerant of low salinity brackish water but not found in freshwater. Quite hardy and easy to keep, this species has been bred in captivity and has some importance as a laboratory animal. Best kept in moderate salinity brackish water (SG 1.010) or in normal marine water at around room temperature. Feeds on various small invertebrates including molluscs as well as some algae. To around 5". Salaria fluviatilis (Asso 1801), the Freshwater Blenny. Northern Africa; rivers of Algeria and Morocco flowing into the Mediterranean, Western and Southern Europe. To six inches in length. Cond.s: pH 6.5-7.5, dH 8-12, temp. 18-24. A subtropical species kept by some European aquarists. Interesting behaviorally. Feeds on small benthic invertebrate animals. Regardless of the species, blennies are remarkably consistent in their requirements. All require water with plenty of oxygen and good circulation. The subtropical species will become stressed if kept in water than is too warm, probably because they cannot extract enough oxygen to keep pace with their increase in metabolic rate. (Coldwater species of blenny will actually come onto land to cool down if the tide pool they are in gets too warm.) Clearly, careful management of temperature is important, and additional aeration, for example by using an airstone, may be necessary during the summer months. While blennies are, on the whole, adaptable as far as water chemistry goes, they are rather more sensitive with regard to water quality. For long term health, low levels of nitrate are important and there should be no nitrite or ammonia at all. This, together with their need for plenty of oxygen, implies that good rather than adequate filtration is the order of the day. Regular water changes are equally important. These physiological shortcomings aside, blennies offer the keen aquarist plenty of rewards. They are remarkably active fish and surprisingly courageous when defending their territories (there are numerous reports of aquarists being bitten by blennies). In the right tank, these fish will become tame to the point that they can be hand fed but blennies are naturally nervous and in tanks with larger, more active fish will tend to stay close to their burrows. Many blennies exhibit behavioural quirks that make them exceedingly entertaining to watch. When resting, blennies have a peculiar habit of curling their tail around and alongside their body, like a cat beside a fireplace. Blennies also enjoy resting in burrows with just their heads poking out. Males will often use their fins and colours for display, and all are highly observant fish that will spend as much time watching the aquarist as the aquarist spends time watching them. As noted earlier, blennies tend to be omnivores feeding on both algae and various small animals. For the most part, frozen insect larvae and crustaceans can be used as a staple, with green algae used to augment the diet for those species for which it is required. None are enthusiastic about dried foods like catfish pellets or flake, though these may be taken eventually. Newly-imported specimens may need suitable live foods during the settling in phase. 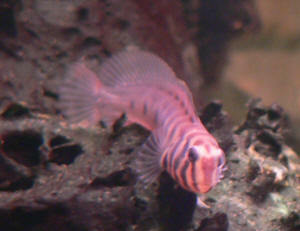 Blennies are not commonly bred in home aquaria though it has happened from time to time. Essentially their breeding behaviour is similar to that of gobies, with the male guarding the eggs but not the fry. Like gobies, the fry are relatively small and can be difficult to rear without suitably small live foods.